Catching up on my reviews of recent restaurant openings in Cambridge hasn't been easy after the 5 days I've just spent raising money for Oxfam by living below the extreme poverty line on £1 a day for food and drink. We all know how much I love food, so it was no easy task. But I did raise over £500 to help eradicate poverty and learned a great deal about food waste, cooking creatively, and more considerate shopping along the way. 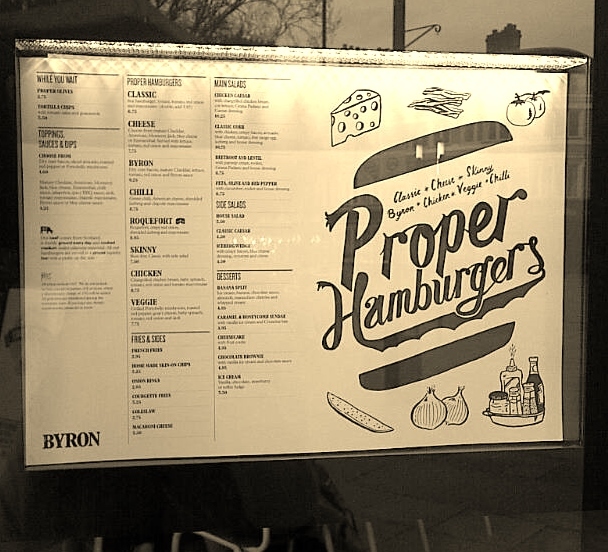 Just before I started living below the line, I visited the newly opened Byron burger restaurant on Bridge Street and had a mighty fine feast. 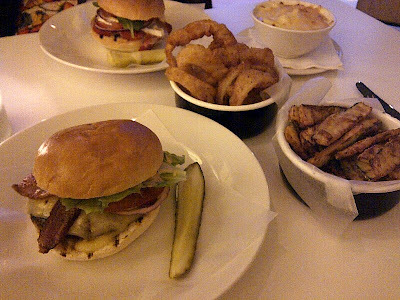 My first visit to the no frills 30-strong burger chain, its concept was clear: the ultimate American diner burger, using the best Scottish beef, served with a smile and a heap of tasty side dishes.  Its highly polished customer service and no reservations policy smacked of yet another chain churning out independently styled venues to make us think they're different. Too cynical? 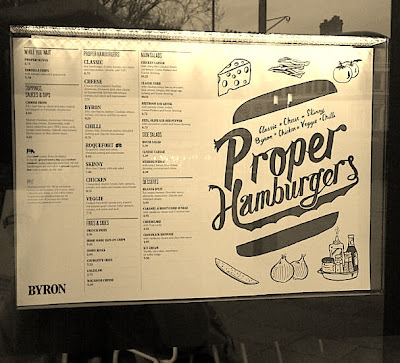 Considering the passion that fuels the burger-based ideals of Byron founder Tom Byng and the company's dedication to sustainability and sourcing from smaller producers, this time, maybe. From the subtle nod of the maitre d' to seat us in a roomy booth by the window to the ever-attentive waiters and their eagerness to traipse back and forth to the kitchen with our questions, within the first ten minutes of visiting Byron I realised how awkwardly bad the service usually is in the city's chain restaurants. The attention to this important detail was just enough to make us feel well looked after, without becoming stiff, stuffy and ruining the laid-back, eat-with-your-hands vibe the staff so effortlessly cultivated. Suitably relaxed, we moved on to the menu; a simple line-up of the Byron all stars - authentic burgers with substantial toppings - and their partners in crime, also known as three types of fries, onion rings, and the "down home" classics of creamy coleslaw and comforting macaroni cheese, and some token salad dishes. Service was quick and the food was fresh and hot. We were impressed by the generous portions of three rather indulgent side dishes of courgette fries, their lightly fried coating reminiscent of a superior vegetable tempura batter, onion rings, which were huge, well-seasoned and came with a satisfying crunch, and a creamy mac 'n' cheese that you could imagine someone bragging about their grandma making. The burgers were simply presented on a big plate with the obligatory sheet of greaseproof paper and giant pickle. I know we call it gherkin here but the whole ambience of the place made me go all American. The burgers were expertly layered so they appeared stuffed but didn't need one of those annoying little cocktail sticks to hold the bun together, which always appear pointless as I'm about to destroy the whole ensemble in one swift stroke of the knife anyway (or bite, depending on how hungry I'm feeling). At this point I was coming over all Homer Simpson, most unlike me, and pointing at things in awe, more usual for me when in foodie situations. 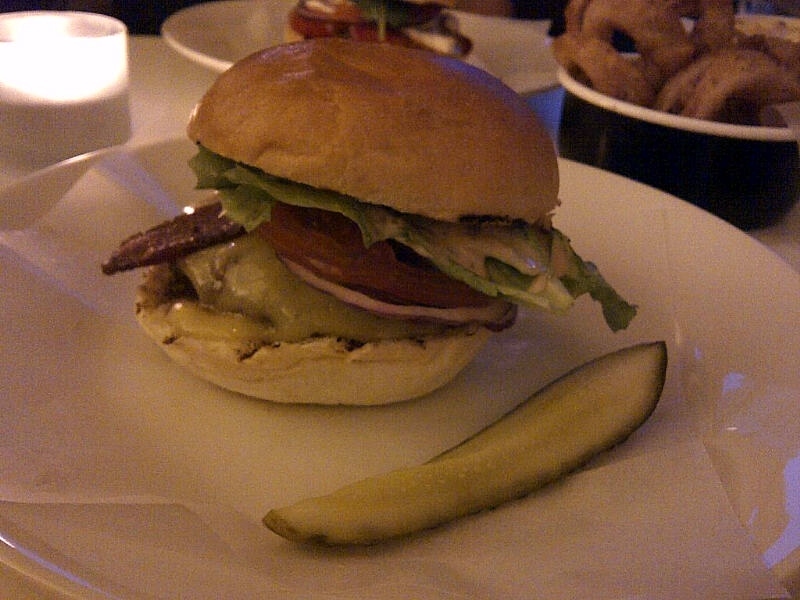 Burger - good. Byron Pale Ale (aka Beer) - good. Sides - gooood. I took it as a good sign that I couldn't decide which burger to choose for a good 15 minutes, even though I was really hungry. I was tempted by the Chilli option, then the good old Cheeseburger, and even the slightly gimmicky Roquefort Burger took my fancy for a few seconds, but I decided to start with the classic Byron Burger. And work my way around the menu until I get bored of burgers or the street food revolution pops up for another go in a few years' time. Once I got working on the Byron, consisting of a well-sized Scottish beef burger, dry cure bacon, Cheddar and the usual heap of crisp salad and red onion, I found it almost too filling to finish. The special Byron burger sauce was spot-on, a secret recipe that's got all the good bits of the old school Big Mac without the horrific aftertaste, and held it together so well I couldn't resist scoffing every last bite. I couldn't help feeling a little cheated that perhaps I filled up on the huge bun, which was soft and squishy but certainly not as sweet and shiny as the PR pics had made out. Very sensibly I took along the Blog's vegetarian correspondent, Miss V, who isn't afraid to declare that a bean burger shoved in a sliced bap just doesn't cut it anymore. Now Miss V hasn't had an outing on the Blog since her green tomato chutney caused quite a stir back at Christmas, but she's been getting around a bit lately. 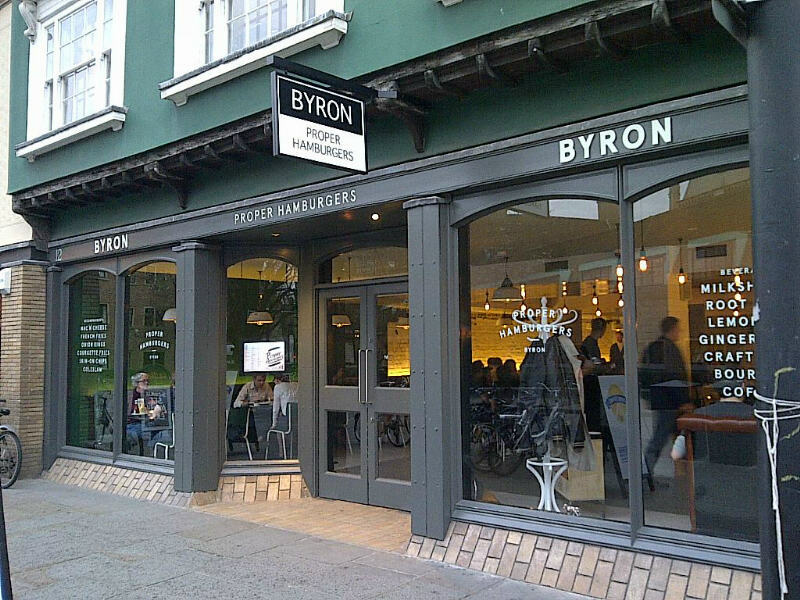 After introducing her to the delights of Steak & Honour's 'shroom burger a couple of weeks ago, which she loved, I knew Byron had a tough job on its hands to impress this veggie vixen. 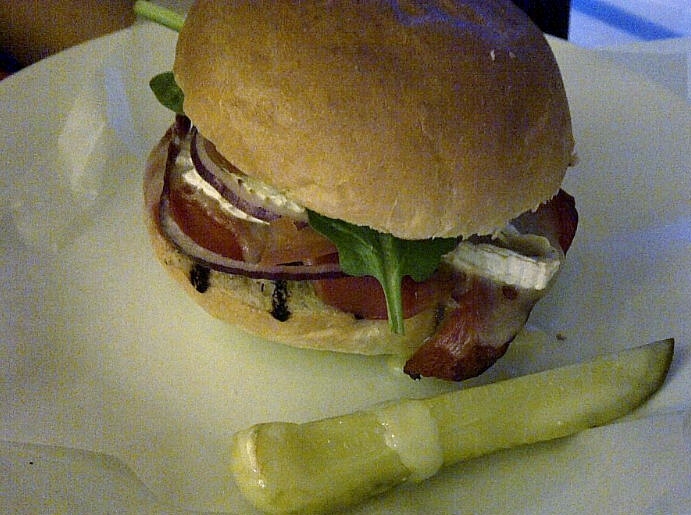 Lucky for them, Miss V couldn't fault it, from the very welcome red pepper and melting goats cheese combo, to a large, soft mushroom that didn't soak juice into the soft, springy bun. Seal of approval given, we turned our attention to the dessert menu. I'm not afraid of a challenge (see previous 5 days' posts!) 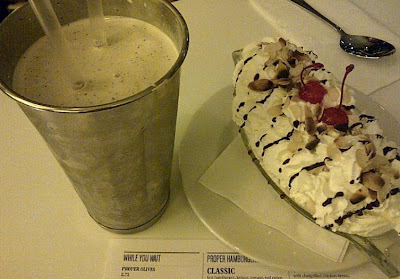 but when a banana split the size of a boat turned up at the table, plus a bucket-load of Oreo Milkshake, I was incredibly relieved that I'd persuaded Miss V to share dessert. Phew. As tempting as layer upon layer of ice cream, whipped cream, chocolate sauce and banana sounds (I'm not even sure if I'm joking or not), I definitely couldn't have managed this bad boy alone. Mostly, I found it all too much but, for £4.95, it's a rather generous if bog standard apres-burger kind of dessert. But then I discovered the layer of ice cream was actually split into three sections: chocolate, banana, and vanilla. A banana split version of Neapolitan! Topped off with our childhood favourites, the maraschino cherry, we decided it was a winner. The Oreo Milkshake, delicious as it was, was verging on overkill but I'd strongly recommend it instead of a dessert or if you've got a rainy afternoon to waste and you don't want to pay for refills. It. goes. on. forever! 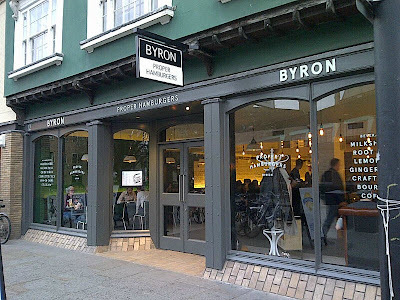 Whether we're calling it a chain or collection of independently styled restaurants, Byron has brought new life to what was sadly becoming a row of mediocre concept restaurants in Cambridge and I'll definitely be planning a return visit very soon.